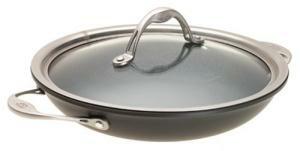 The hard anodized interior and exterior of this pan have been infused with a nonstick polymer. The aluminum provides great distribution of heat and helps to cook without burning or hot spots. The nonstick allows speedy cleanup and provides easy release of food. Cook with less oil and finish with a pan which will resist stubborn stains. The ergonomically shaped handles are generously proportioned and stay cool on the stove. Rolled sides and edges aid in the preparation of foods like omelettes and are great for those foods you need to keep moving in the pan. The flat rims help you pour without spilling. The entire pan is stain resistant and safe for metal utensils. The pan can be used in ovens up to 700 degrees. The tempered glass lid is domed, helping draw moisture back into your dishes; it lets you view the cooking process without lifting the lid and losing valuable nutrients. And as always, Calphalon comes with a lifetime warranty. Nonstick coating on the pan's exterior? Why have we waited so long for this?! Extremely easy upkeep, the benefits of cooking with aluminum's handling of heat- what a marriage of convenience. The unique bowl shape makes it nice to place right on the table for serving. This pan has gone right to the top of the list of favorites. Some people never bother to put it away. Compare this with the Cuisinart Chef's Classic Everyday Pan.